Template to successfully welcome new employees to your company. Give New Employees a Warm Welcome with a Great Company Presentation. One of the most important aspects of corporate teamwork is a pleasant working atmosphere. Social relations at work are vital when it comes to motivation, efficiency and loyalty. As a successful company, it pays to encourage open communication and constructive support right from the start. Use our template to present your company, its departments, new colleagues and your corporate mission statement in a structured and convincing way. 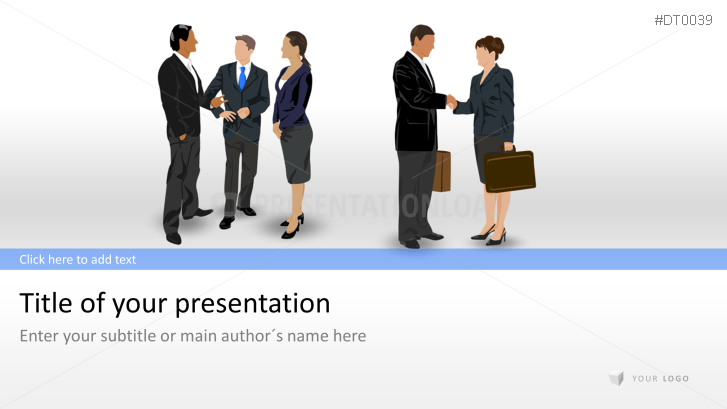 Start your welcome presentation with graphics of business people in different situations to give your new employees a positive impression of the day-to-day activities in your company. A wide range of background images helps create an engaging presentation, while business icons and themed slides can be used to introduce each department. Use a stack of coins graphic to familiarize your new employees with financial topics and discuss possible developments with diagrams and graphs. Present your company as friendly, transparent and respectful of its employees.